Are there days when you feel quite down? Days when you feel surrounded by darkness? It could be bright daylight, and hot outside, but you feel all alone, and surrounded by obscurity? 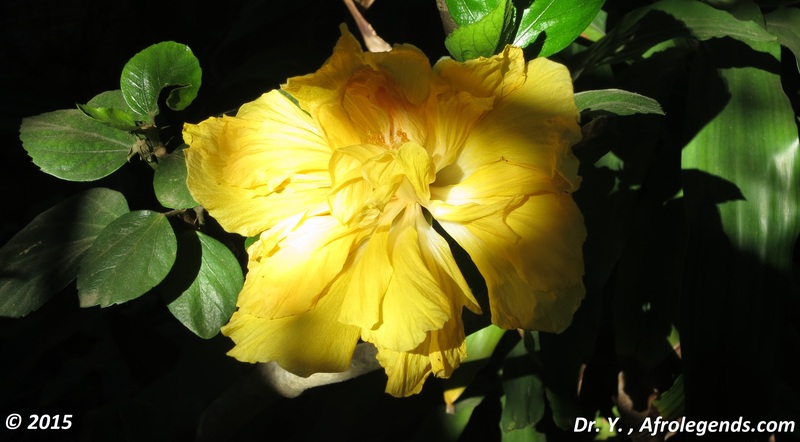 Well, I saw this yellow hibiscus flower, and the way the sun rays fell on it caught my attention. It was as if the flower was emerging from darkness and into the light. What more, it seemed that the flower had never been touched by the darkness, its beauty was always there, and it just needed a ray of light to be rediscovered. It is the same for you: there is no darkness. Your beauty, intelligence, and being remain intact no matter what your mood might be, and all you need is a ray of light for your grace to be revealed… so let go of the obscurity, the past, the heaviness, and just shine, be revealed. May you emerge from darkness into the light just like this yellow hibiscus flower. Enjoy!